Luke 7:33-35(KJV); For John the Baptist came neither eating bread nor drinking wine; and ye say, He hath a devil. The Son of man is come eating and drinking; and ye say, Behold a gluttonous man, and a winebibber, a friend of publicans and sinners! But wisdom is justified of all her children. The wisdom of God vindicates a minister of God. There came a time when John the Baptist’s stand as a minister of God was called into question. Because he lived a life of constant fasting, neither eating nor drinking, he was dubbed as demon possessed. Christ’s stand as a minister of God was questioned by the religious men of His day. Simply because he ate and drank, they called him a glutton, a wine bibber and a friend of publicans and sinners. To all of this, Christ had this to say, “Wisdom is justified of all her children.”(Luke 7:35). 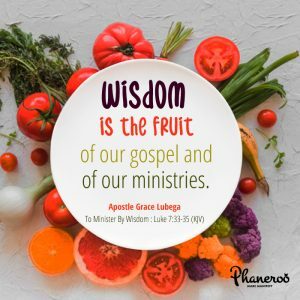 Wisdom is the fruit of our gospel and of our ministries. This is more than simply having big numbers in one’s meetings; one may attract large crowds yet destroy many because he or she lacks in wisdom. It is more than healing the sick; one may heal the sick but not in wisdom and in the end stumble so many others; where is the wisdom in your healing? Beloved saint, aim to always minister in wisdom and by the wisdom of God upon your life. Praise Jesus! PRAYER: Father, I thank you for this Word. Lord, I know that you are my wisdom and it is by this that I minister and do all that I ought to do. The fruit of my life speaks for itself because it is the testimony of the wisdom of heaven. In wisdom I teach, in wisdom I give and in wisdom I change my world, to the glory of your name. Amen.